Since the 1990s, email has evolved from a tool used primarily by technical and research professionals to become the backbone of corporate communications. 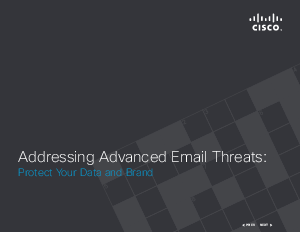 Each day, more than 100 billion corporate email messages are exchanged.1 Security has naturally become a top priority. But mass spam campaigns are no longer the only security concern. • Inbound threats are becoming more organized, more personal, and more pervasive. • Meanwhile, the potential for outbound leakage is great, with devastating consequences to your reputation and finances.